We’d love your help. 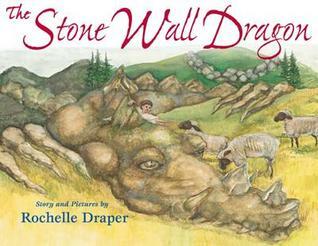 Let us know what’s wrong with this preview of The Stone Wall Dragon by Rochelle Draper. This is the fanciful tale of a boy who takes a fall on a stone wall while exploring his family farm in Maine. When he awakens, the wall has turned into a dragon that invites him to climb aboard for a magical ride to the sea, through blueberry barrens, sheep pastures, beaver ponds, and small villages. The imaginative illustrations are done in watercolor and gouache. To ask other readers questions about The Stone Wall Dragon, please sign up. Wonderfully creative story idea, but some awkward phrases and illustrations detract a bit. "Woodland creatures do not take flight. You are seeking treasure in the sea." This does lead the story to the sea, but it seems the boy is riding the dragon. If you look at the title page illustration, it seems the rock wall simply winds through the town down to the sea. The boy could have just walked down the wall. Makes sense how they travel back across the same terrain, but they stop at a lake not menti Wonderfully creative story idea, but some awkward phrases and illustrations detract a bit. "Woodland creatures do not take flight. You are seeking treasure in the sea." This does lead the story to the sea, but it seems the boy is riding the dragon. If you look at the title page illustration, it seems the rock wall simply winds through the town down to the sea. The boy could have just walked down the wall. Makes sense how they travel back across the same terrain, but they stop at a lake not mentioned on the trip to the sea. Having the boy hit his head provides a good avenue for the adventure, and how he thinks he sees a wink at the end. The illustrations of the boy and other people are slightly off balance and proportion.